http://www.speedtest.net/result/4075608314.png 13.7 Mbps Download speed. Good, that's a bit over what I'm supposed to get on the 12/25 plan. 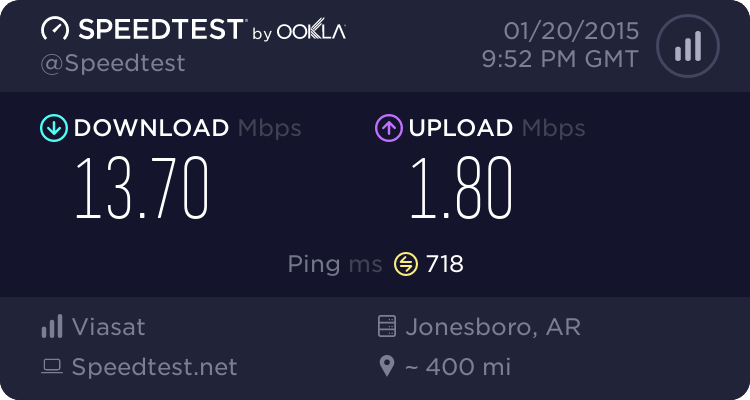 BUT http://imgur.com/5iE44Lx 1.20 Mbps when actually downloading a file. How can I get one result on a test and yet in practice it's not even 1/10th the tested speed? Hello Bev, the download speed is limited by how quickly the site being downloaded from is uploading the data. If you have any further questions please send in an email to exedelistens@viasat.com. Bev - Yeah, I can test +20 Mbps before and after I download from a certain site that consistently downloads at .05 Mbps. Even the behemoth Microsoft does not usually stream my updates at full speed. I don't stream video or DL music, don't use social networking at all, only do updates at night. I know well what uses bandwidth and, I keep tabs on what I have used. I will use it to update a game I enjoy during the day IF I cannot play w/o updating. I have no problem buying more data if I legitimately used it and, I have never had data disappear unexplained.